I’ve needed to update the website for a while, but it hasn’t been at the top of my list. Soon! In the meantime, check out my new blog post about Amazon, or subscribe to the newsletter. Bookspace is an ever-evolving concept whose main aims are to spread awareness through the Columbus, Ohio area through self-education, self-empowerment, and community involvement. 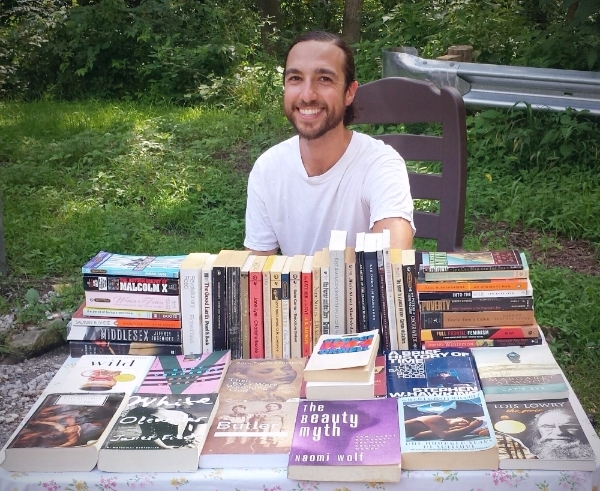 Since summer 2015 Bookspace has distributed quality books and zines via flea markets, poetry readings, and other events throughout Columbus. The ultimate goal is to occupy a full-sized shop of Bookspace's own, to distribute many more books, zines, and art, but also to host community-building events such as readings, small music shows, skill-sharing workshops, art exhibitions, and other educational events/performances. 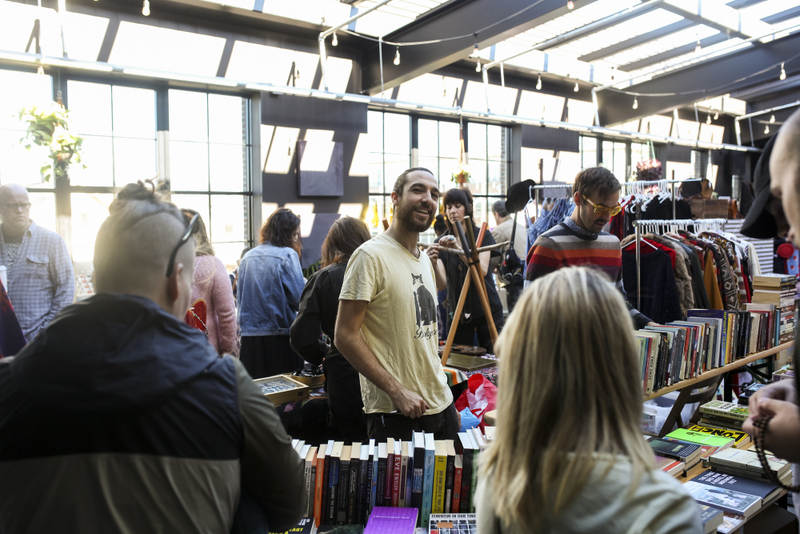 The Holiday Flea, December 2, 2018 at Seventh’s Son Brewing. Photo by Nathan Ward. From March 2nd to June 18th, 2016, Bookspace ran a pop-up bookshop in a shared workspace in German Village called Studio 595. This was my first experiment in running a physical shop. I should introduce myself here. My name is Charlie Pugsley. When I officially started Bookspace in July 2015, I signed up to sell books at a few markets and had no idea how people would respond. But I have been pleasantly surprised at people’s interest in books, and how much they appreciate the presence of an independent bookseller with a nice selection. I want for Bookspace to be much more than a bookseller though. I want it to be a place where people in the community feel comfortable being, where they feel linked to the life of the rest of the city. I didn’t grow up reading a whole lot. In high school I often read CliffsNotes, avoiding the reading of the actual text for fear that it was too long or boring. After college I realized that although I didn’t want to go to school anymore, I wanted to keep learning. I loved learning, almost in spite of our culture of perpetual schooling. So I read whatever I was interested in, and was quickly able to refine my worldview and concept of myself, thereby increasing my confidence as a person and a citizen of the world way more than I was able to while reading in the traditional context of school. I was better able to focus on the issues of the world that I felt drawn to, and was therefore more able to make a difference in those areas. I became more aware of different forms of activism, as I saw many glaring causes that needed attention but were getting close to none. At the same time, I saw many of those around me disengaging, spending more time watching television screens with the same old plotlines and looking at cell phone screens full of information, but lacking in substance. Since then I have become very passionate about books, zines, and other ways of sharing information. I strongly believe in the benefits of self-education. I do not believe that one must incur thousands of dollars in debt going to school in order to learn about what they can effectively do with their time on this earth. Sometimes it's as simple as reading a book or two, and talking about it with a friend. I want to be your neighborhood bookseller, and I want Bookspace to be a place where you think to go when you want to learn something new about our world.